When Disney unceremoniously pulled out of co-financing the Chronicles Of Narnia franchise just before the New Year, shock waves of doubt and remorse echoed through the Vulture comment section. However, thanks to the good graces of the people over at Fox, fans of the dream world of magic can spark up a celebratory jay and hit the Magnolia Bakery tonight, because the franchise is back on! Yes, that’s right, Variety is reporting that The Voyage of the Dawn Treader looks to have pulled an Aslan and come back from what appeared at first glance to be certain death. But, as we learned in Pet Sematary, resurrection comes with a price. While it looks like both the film’s principle cast and director will be clearing some time on their calendars this summer to shoot the picture, some sacrifices had to be made on the budget front to make the project viable. 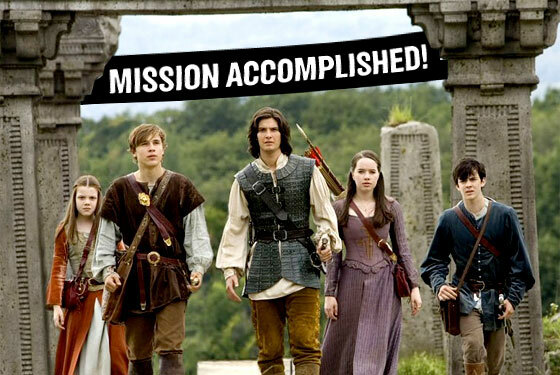 According to the Los Angeles Times, Disney spent some $215 million producing Prince Caspian, and another $175 million on marketing it (the film ended up grossing roughly $419 million worldwide). So, in order to lessen the risk on Dawn Treader, Walden Media and Fox have decided to go halfsies on the third film’s slated budget of $140 million. While we’ll have to wait until late 2010 to see what effect (if any) this budget cut has on the final product — don’t be surprised if stock footage from Sigmund and the Sea Monsters replaces the special-effects sequences — we are hopeful that this new partnership will spend their budget more wisely than Clint Eastwood spent his on Gran Torino.